Hittin’ the slopes with your kids. When cabin fever hits this winter, there’s no better cure than some time on the slopes. Skiing can be exhausting, in a good way. A full day on skis or a snowboard is sure to wear you—and better yet, your squirrelly kids—out. But, just getting you and your crew there can be draining. 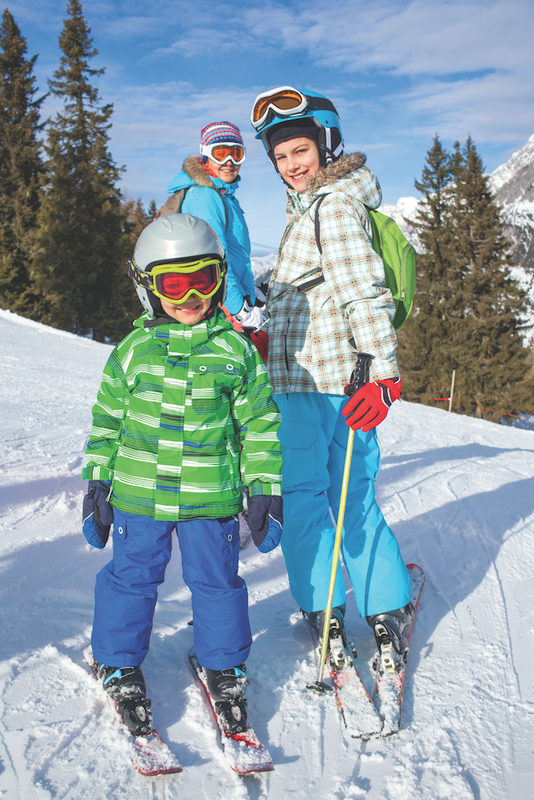 Here are a few tips to avoid the stress that comes with including children in your ski plans. 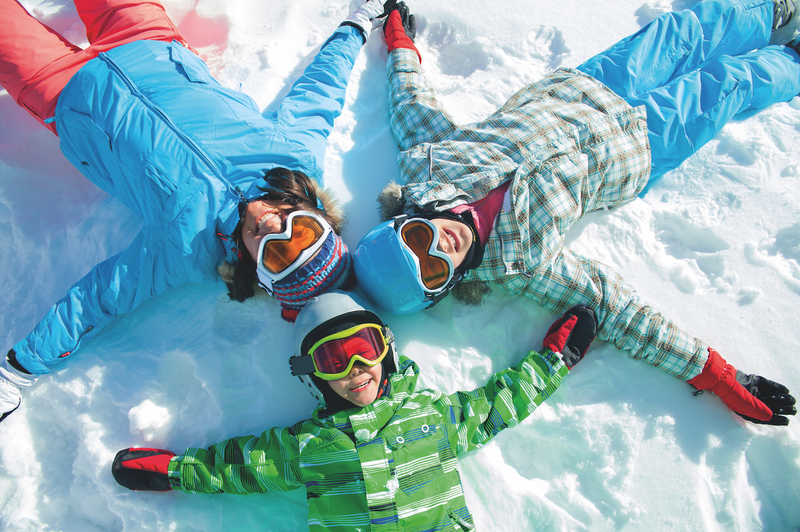 With some planning, preparation, and a little perspective—you’ll be well on your way to pursuing a new winter pastime with your family. No. 1: Practice before you go. You don’t need a bunny hill to introduce children to skiing. A snow-covered yard will do. Invest in a pair of youth beginner cross country skis—Madshus Snowpup ($59.95 at rei.com) is a good choice—and get your son or daughter on them as soon as the snow flies. The Snowpup comes with universal bindings that accommodate almost any winter boot, so strap the skis on your little one’s feet and watch him go. Shuffling around on the snow develops balance and coordination—two things that will come in handy when your child’s ski tips are actually pointed downhill. No. 2: Start ‘em young. It pays to put kids on skis early. Children under six years ski and snowboard free with a paying adult at both Mystic Miner and Terry Peak, two family-friendly ski areas in the Black Hills. Introduce youngsters to the sport early enough, and they’ll know their way around the mountain by the time you pay their way. What’s the best way to teach your aspiring shredder? If you have fond memories of dad taking you to the top of a run and letting you figure it out on the way down, then by all means, carry on the tradition. But not every child responds to grandpa’s sink-or-swim strategy, and that’s why ski lessons are a good choice for beginners. Ski Mystic offers one-on-one instruction for patrons as young as three, and group lessons are open to skiers and riders ages three, and up. Terry Peak offers private lessons only to potty-trained two- and three-year-olds; children must be at least four to participate in group lessons. No. 3: Consider buying your child’s equipment. If you plan on skiing the Black Hills at least a half a dozen times this winter, consider purchasing your own equipment. Most kids can get two seasons out of skis, boots, and poles; so, it makes financial sense to buy if you have more than one child. New ski boots cost about $100; skis and bindings cost another $150 to $200. Roces’ IDEA 6-1 adjustable ski boot promises the biggest bang for your buck ($135). The boot grows several sizes to accommodate children’s growth spurts. Expect to pay around $20 for an all-day ski rental for children 12 and under from the folks at Terry Peak and Mystic Miner. Use caution and don’t buy used skis just because they’re cheap; make sure they fit your child. You can rent helmets, but there’s something to be said about knowing whose noggin your kid’s helmet has been on. Youth ski helmets run the gamut from affordable functionality to pricier versions with a little more flair. Frozen is cute to watch on-screen. It’s not so cute when it happens to be your kid’s fingers and toes. Start with a base layer—C9 by Champion makes inexpensive thermal underwear for boys and girls ($14.99 at target.com). Add a mid layer like a fleece top and bottom. Finish with an insulated, waterproof jacket and pants. High-waist or bib-style bottoms lend extra warmth and make a great outer layer for youngsters; and of course, there’s always the one-piece snowsuit option. If your tyke isn’t toilet trained, save yourself some bathroom drama and skip the one-piece snowsuit. Once you’ve got arms and legs covered, it’s time to clothe the extremities. A neck gaiter is a non-negotiable. Better yet, buy a baklava to protect those cute cheeks from the elements. Seirus’s Thick N Thin Balaclava comes in fun prints to pacify any protests and is thin enough on top to comfortably fit under a helmet. Don’t forget to wash gaiters and balaclava frequently, as they double as snot collectors. Don’t even think about putting cotton next to your kid’s feet. Ever heard the adage, “cotton kills?” Cold, wet feet will kill your well-laid ski plans. Smartwool ($15.95 at smartwool.com) sells ski and snowboard socks to fit the smallest skiers and riders. You may be tempted to save a few bucks by leaving goggles out of your burgeoning ski budget; don’t! Goggles protect the eyes from snow, wind and the sun’s glare, and your $25 investment will last several seasons if cared for properly. Lastly, don’t forget fingers. Gloves afford dexterity, but mittens provide more warmth. Either way, make sure they’re insulated, waterproof and come with long cuffs to keep the snow out. The North Face line includes toddler mittens ($30 at Scheels) that feature a zippered closure on the back of the hands. A hand warmer will fit securely in this pocket, which means long-lasting heat. Buy these air-activated pouches in bulk, you’ll use them. No. 5: Eat, drink & be happy. If you’re looking to save money, eat breakfast before you go and pack a lunch. Sure, you can grab something at the lodge, but you’ll pay more for it. Hunger and thirst will strike your bunch, so be prepared. Stash a Capri Sun and other snacks in your pockets for the chairlift. Mini Babybel cheeses, Go-Gurt and chewy granola bars are good grab-and-go options. If you’re still sitting on a hefty Halloween stash, use some of those miniature candies as rewards or incentives. No. 6: Make a list & check it twice. Jot down a list of everyone’s gear and check off every gaiter, glove and goggle as you pack up the night before your trip. Sure, it might dwarf Santa’s naughty list, but it’s not going to be nice when you discover only one of your kid’s mittens made it into the minivan. No. 7: Have a little perspective. So your preschooler couldn’t pull off a 360 by the end of his first day. Maybe you could have dialed every single one of your contacts in the time it took to coax your kid down her first green run. Keep in mind it won’t always be this way. One day you’ll be telling him to go easy on the acrobatics and reminding her to slow down!